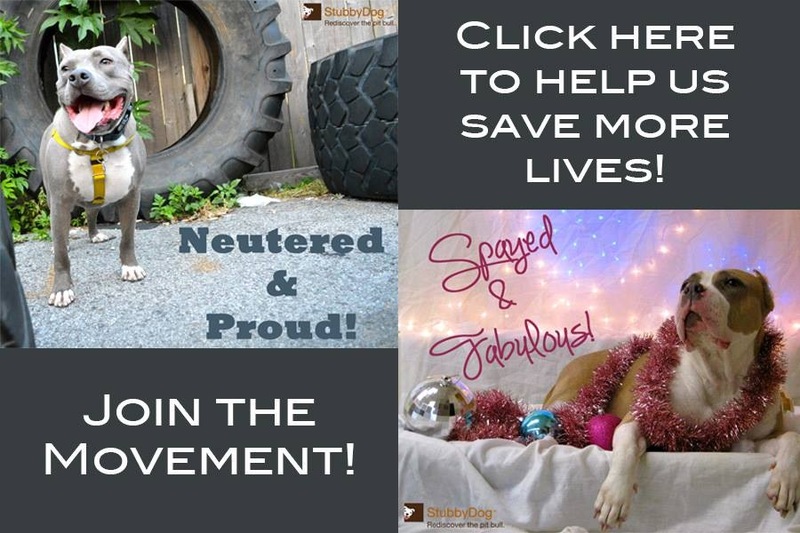 When I first started volunteering I was, at best, “pit bull neutral.” I had some vague sense of the reputation, not enough to make me hesitant about the breed. And then I met Kahlua. I was a new volunteer at a shelter and an absolute novice when it came to dogs – having had only cats. My first experience with Kahlua, although memorable, did not have a positive outcome. 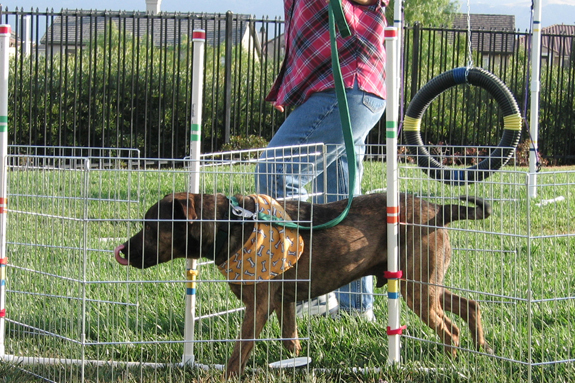 Eager to optimize every opportunity to get involved, I signed up for obedience training. 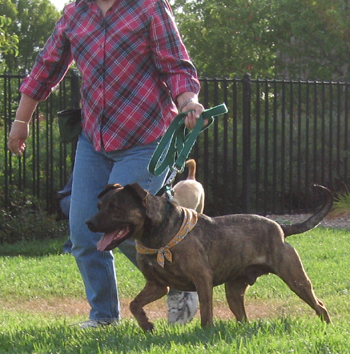 One of my assigned dogs was Kahlua, a 7-year-old brindle pit bull mix. I thought everything was going fine until we got kicked out of the class. Apparently, Kahlua had “locked onto” another dog with a hard stare, and the trainer had us removed. As a result, he was banned from all future training classes. It became my mission to restore his reputation, especially after discovering what an incredibly well balanced, happy, loving dog he was. 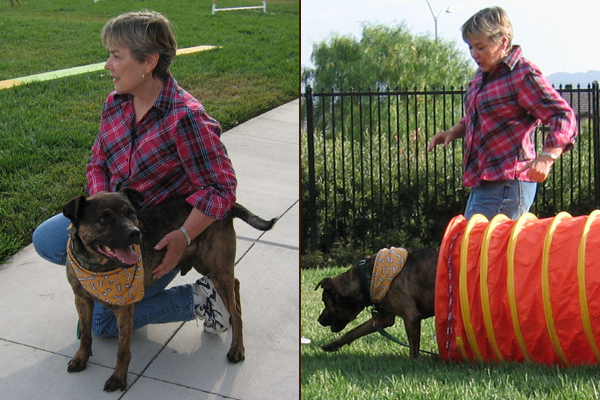 Not many dogs do well in a shelter environment for an extended period of time. But Kahlua thrived. He was everybody’s favorite and got lots of attention. Although our beginnings were less than auspicious, and although I fell in love often, Kahlua was always No. 1 – and not just for me. He became the volunteer favorite, with many admirers. One of them would sit with him and let him wash her face with kisses. She would leave, clean her face and come back, and then let him do it all over again. Kahlua had been surrendered to the shelter when his guardian was hospitalized and no longer able to care for him. He showed all of the signs of a well-loved companion, and it was heartbreaking to see him get passed over for dogs less well behaved than he, for reasons all too familiar to those of us who fight for pit bulls. And his advanced age didn’t help. Over time, my wish to take him to a training class was finally granted. 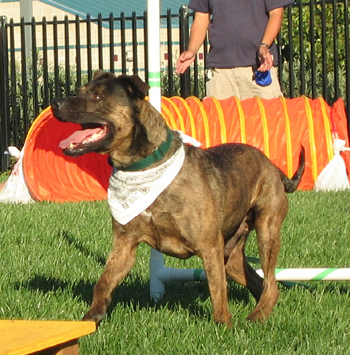 He was given the green light to participate in an agility class. Finally, redemption was his. He excelled and I was over the moon. Several days after the completion of the agility class, I offered to represent the shelter at a local wine festival on the condition that I could take Kahlua. I wanted him to have a chance to meet potential adopters outside of the shelter. The day of the festival I was told I couldn’t take him because there was a family coming to see him. I was so disappointed at the thought that he was missing his big chance. What I didn’t know at the time was that they weren’t just coming to see if they might be interested, they were coming to take him home. It was the family I had prayed for – the one with the teenaged boy, who would be his best pal. So, I said my goodbyes and went to the festival without him. When I returned he was gone, with a very tearful sendoff. I did, however, get to meet his new family when they came back to the shelter for training. They were a perfect fit. Kahlua had some adjustment problems at the outset – he didn’t like being left alone, I suppose due to all of the attention he got from us. But, his family was determined to give him the best home possible, and last I heard he was doing great. His stay at the shelter was just shy of a year. I was lucky to have known him until he was adopted nine months after I met him. The time with him developed into a bond that was unbreakable. I had a tough time adjusting to his absence, but he left me with a devotion to pit bulls that will last a lifetime – and a soft spot for brindles. Tears of joy and an angry face for the trainer. These dogs are bullies in every since of the word…in a good way of course! He was thrown out of a class for staring at another dog?! Wow, I hope you moved on to a more knowledgable (and capable!) trainer after that. I also love how it was “locking” because he is a pitbull mix. Ugh. tammplit Silly right, Kahlua is just a dog. Yep, just because someone is a “trainer”, doesn’t mean they’re a dog behaviorist expert…seen it time and again. Yay for Kahlua! Yay for Virginia’s first experience in the wonderful world of bullies! I hate to say it but that trainer apparently isn’t the brightest crayon in the box.Dogs stare sometimes.That’s just what they do. Wonderful story. Wow, kicked out of a class for staring? My guy has a high prey drive and will intensely stare, but all it takes is a “look” command and it snaps him out of it. Some dogs stare…that’s just how they are. laurieburton Very true, but kahlua triumphed over all. Virginia, you just reiterated what we all have learned: it only takes ONE to turn our minds and hearts around!! barbaraleeanderson07090 Ain’t that the truth! I have difficulty with “experts” who are anything but! My pibbles will give each other the “rare look” and then get into an intense play session. I’ve seen the trainers whom I believe are buying into the pitbull hype and are really just afraid of them. Those types jus perpetuate the problem and the myth. Thank you for the wonderful story about Kahlua. My girl is a brindle too! I was told that I would have to “crate and rotate”. I’m pleased to say that I’ve never had to do that.